Blackberries are a bramble growing fruit plant with a growing habit as either erect or trailing. The erect varieties are lower in maintenance and recommended for growing in the home garden in Pennsylvania. Blackberry canes are hardy to plant in USDA growing zones 5 through 8. The canes can be planted in the cold northern areas of Pennsylvania where the temperature does not drop below 0 degrees F as long as winter protection is provided. Blackberries will produce their first harvest three years after planting. 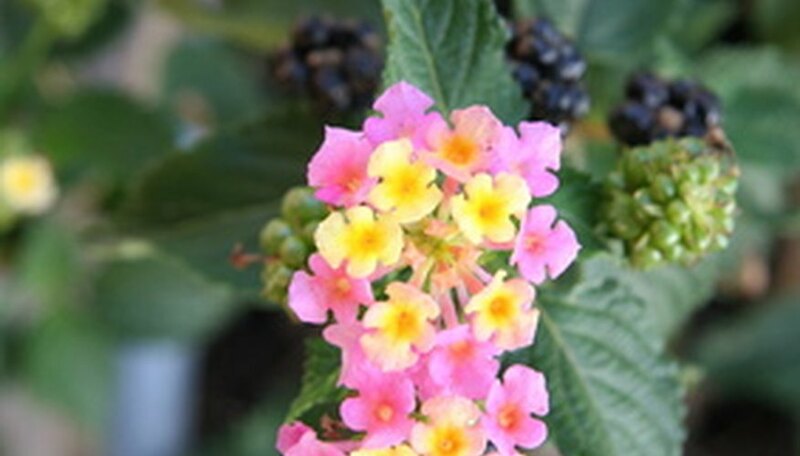 Choose a planting location for the blackberry canes that has a well-draining soil and full sunlight conditions. The area should have good air circulation to decrease the risk of disease. Prepare the blackberry planting area the fall season prior to planting in spring by removing all weed and vegetative growth. Test the soil pH to verify it is 5.5 to 7.0. Add ground rock sulfur to the soil to lower the pH if needed. Apply 3 to 4 inches of organic compost or peat moss to the planting area. Work the compost into the soil to a depth of 10 inches with a garden tiller. Soak the roots of bare root plants by placing them in a bucket of warm water several hours before planting. Dig planting holes that are the same depth as the cane was previously grown and twice as wide as the root spread. Set the cane in the hole and gently spread the roots out. Fill the hole with soil and gently tamp to hold the cane in place. Space blackberry canes 4 feet apart. Water the blackberry canes generously after planting. Apply 1 inch of water to the canes each week during the spring season until berries have formed. Increase the daily water amount to 2 gallons for each plant during the fruit production period. Fertilize blackberries one month after planting with a complete 10-10-10 fertilizer. Apply fertilizer annually to established canes in early spring before growth appears on the canes. Apply pine straw or wood chip mulch around the canes at a depth of 2 to 3 inches. This will assist with moisture retention in the soil and decrease competing weed growth. Prune blackberry canes in early spring by removing damaged, diseased and dead canes. Prune to remove 3 inches from the top of the canes in mid-summer. Remove 2-year-old canes that produced fruit after the berries have been harvested. Do not plant blackberries in soil that previously grew potato, tomato or pepper plants. Winterize blackberries grown in northern Pennsylvania by banding 2 to 3 canes together, gently bending them over without breaking and covering with topsoil or mulch to protect the roots. Remove the mulch when the soil beings to thaw in spring and gently pull the canes upright to begin growth. Erect growing blackberry varieties that grow well in Pennsylvania are Arapaho, Apache, Chester, Navaho, Ouachita and Triple Crown.